Off-Page SEO optimization is a process of making one’s website popular over major Search engines like Google, Yahoo and Bing by working on various activities. 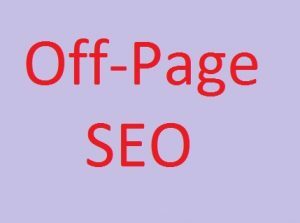 If you also want to improve your business sales or popularity online then you have to work on off-page SEO after website is on-page optimized. We all know about the most popular activities like Social Bookmarking, Classifieds, Press Release, Web 2.0, Photo sharing, Forum Positing and many more. Search Engine Submission: If your website is new then make sure of its indexing. There are major Search Engine directories available online you can list your website in them to make your website indexed. Infographics: In Simple words, a graphical representation of data or information. Few of us show interest in reading lengthy articles and many just avoid. Infographics are visual treat to the readers as in them people can add content in various forms i.e. images, shapes, colors etc. Social Shopping Network: If you have an ecommerce website then you should add this tactic in your strategy. In this activity you can easily advertise and do branding for your products by adding them to the free shopping sites such as Google Product Search, MSN Online Shopping, Yahoo Online Shopping and many more. Video Promotion: If your business already has videos about the services or products then it is highly recommended that have a YouTube channel for your brand and its videos. People can better understand by watching them online. You can specify various things in videos like reviews, what that particular product or service is all about etc. But If your business don’t have any videos then you can create video infographics as well by adding product images, content, shapes, information and then can publicize them on video marketing sites. Local Directories: Local business directories are most important to go with if you are targeting local market. There are many authoritative directories available online such as Google Places, Yellow Pages, Yelp, Insider pages and so on. While listing your website on these platforms make sure of NAP (Name, Address and Phone) as they are the most important things to keep in mind. This off-page SEO is very important only after the on-page SEO is done well. Therefore, it is best to have done a perfect on-page optimization while website is being design and developed. The web design process if possible, should be done with SEO consultant. This way, the website is designed with user experience as well as a good on-page SEO. This will make off-page SEO more effective.